Wheatstone, Inc has sponsored a radio industry future technology study which brings into focus some of the connections between technology and radio business models. It appears to be very thorough, polling radio professionals on all aspects of technology development and management. While it is hard to predict which of the radio industry’s newest business models will succeed in generating new revenues, we can better anticipate the winners by measuring how fast the technologies that enable them are being adopted. To find out, we surveyed the radio professionals involved in all aspects of technology management (engineers, and operations and technical management). The results reported in this study can serve as a benchmark for managers to evaluate their own organizations’ progress. Almost everyone believes that the internet will play a greater role in radio (and all media). This goes against the “radio with its head in the sand” idea that can be found in some corners of the internet (I’d provide a link, but the site has turned on a paywall). The question is, what are management type people doing about it. Some have good ideas on how to bridge the gap between making money the old fashioned way; selling spots, to making money the new way; brand imaging, media promotion and personal contact through new media. While it is generally agreed that radio stations should stream their audio, many, if not most, make little or no money on this. If radio is going to make some revenue on internet applications, obviously some new ideas are needed. Unique local content seems to be the most sought after, things like local news podcasts, or new music, e.g. studio sessions with up and coming band and musicians, locally produced shows that are area specific, etc. Put a 10 second sponsorship in front of those and people will get the message. Other things like value added contests that can only be heard on the internet. Interactive radio station apps that have streaming, now playing, recently heard features that link to a .mp3 store for iPhone and Android operating systems. Text link adds on radio station web pages, etc. On the flip side of this, huge, great amounts of bandwidth will be required if the internet streaming is going approach the same number of off the air listeners. Depending on the how the radio station has the stream set up, anywhere from 20 to 64 kbps of data transfer is needed for each listener. For a station in a large metropolitan area, multiply that by 500,000 to 4,000,000 listeners at any one time and data gridlock ensues. On the in house side, the red hot, cutting edge thing these days is AOIP (Audio over IP), which Wheatstone is heavily invested in with its E console series. While some might not think of AOIP as a traditional internet application, it none the less uses the same transport protocols as other internet applications. AOIP offers some great advantages over other routing systems, as both private (internal) and public (wide area) networking can be used to transfer audio in real time. Of course, this is not as easy as plugging the new computer into an ethernet jack, it takes more planning than that. Wheatstone has published an excellent white paper on Network Design for Ethernet Audio. Well worth the read. As AOIP technology develops more, web streams could come directly from the console and be customizable according to destination. Further, IP logging can create stream user profiles and customizable greetings, listening preferences and so on. This would require that the web streaming server be in house and the studio facility have enough bandwidth to handle all of the outgoing streams and other content. Certainly an in house IT/Web developer will be needed to manage and maintain such a system. 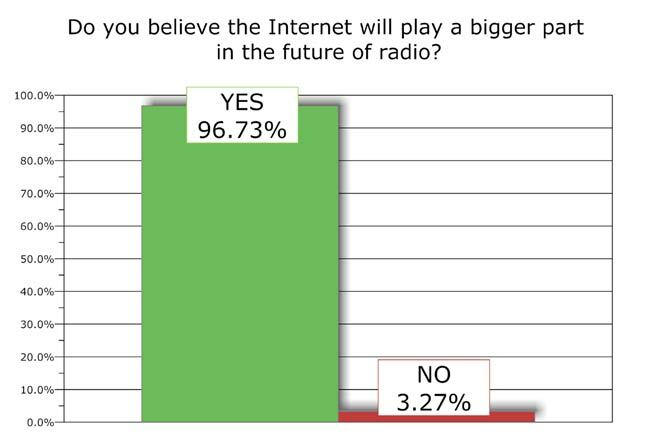 Finding #1: Almost all radio tech people believe the Internet will play a bigger part in the future of radio. Finding #2:Of the new revenue generating technologies, streaming a station’s signal has the biggest earning potential. Finding #3: Technologies that require little or no capital investment are being deployed at similar frequencies by both stand-alone and group owned stations. Finding #4: A technology gap is emerging as stand-alone stations deploy revenue generating technologies requiring investment at only half the frequency as group owned stations. Finding #5: The revenue generating technology that most group owned stations plan on deploying next is a mobile app, while for stand-alone stations, it is broadcasting in HD Radio, with mobile apps coming in a close second. Finding #6: There is a big divide between radio stations that are now, or will soon be, making money from streaming their signal over the Internet, and those who likely never will. Finding #7: The day will come slowly, but in 15 years a majority of radio stations expect they will have more online listeners than RF listeners. Finding #8: Despite the expected decline in over the air listeners, few stations expect to turn off their transmitters. Finding #9: Three years from now, radio station technology will be more IT centric with more automation, as well as more networking between stations, IT networks, and office and audio networks. Finding #10: Three years from now, the stability of each radio station network will be more important, as will networks with no single point of failure. 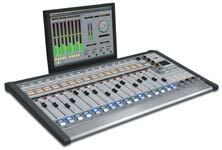 Finding #11: Three years from now, more audio consoles will be networked together. Also, the bandwidth of those networks will be required to increase. Finding #12: The top reason group owned stations bought an AoIP network was to reduce maintenance costs. The top reason for stand-alone stations: to share talent. Finding #13: At stations that have installed an AoIP network, more than a third of stand-alone stations found installing it harder than anticipated, while only 16.7% of group owned stations found installation harder than anticipated. Finding #14: At stations with an AoIP network, more than one in four stand-alone stations and one in three group owned stations report latency problems. The study is a good indication of where technical managers see growth. One thing that internet sites like Pandora have shown, radio broadcasters cannot sit back and be content with the status quo. Without technical innovation and some outside of the lines thinking, radio will be bypassed by newer more interactive media services.